Manchester, England (AP) — England gave Jonny Bairstow another opportunity at the top of the order and he responded with a maiden one-day international century in a comfortable seven-wicket win over West Indies in the series-opener on Tuesday. Bairstow was 100 not out, reaching three figures on the penultimate ball of the match. Next delivery, Ben Stokes launched a six over long-on to seal the win. England finished on 210-3 off 30.5 overs, easily chasing down West Indies’ 204-9 off 42 overs in the shortened match. A two-hour delay for a wet outfield meant the game was reduced to 42 overs per side, but any notion that that would play into the hands of the West Indies, the world 20-over champions, was convincingly dispelled. Apart from a burst of boundary-hitting from Chris Gayle at the start of the West Indian innings and a fighting 41 not out from Jason Holder at the end, the tourists were outclassed. Stokes took 3-43 to restrict the West Indians to the below-par total despite the rapid start from Gayle. Chris Woakes and Adil Rashid had two wickets each. 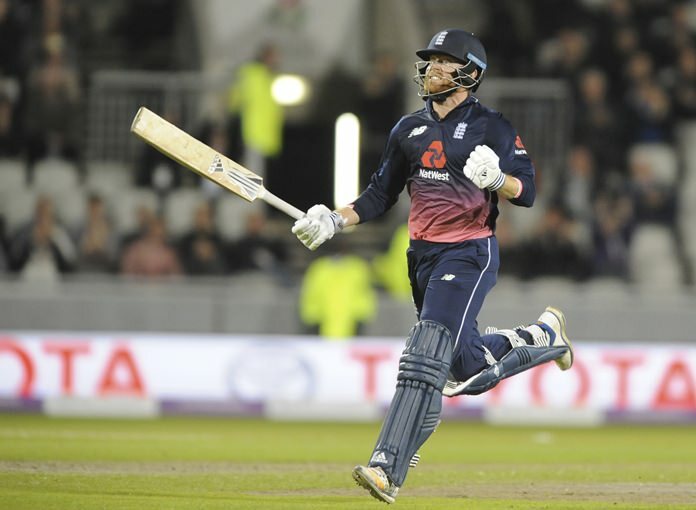 Bairstow and Joe Root (54) put together a 125-run stand for the second wicket and England won with ease to take the lead in the five-match series. Bairstow was promoted to opener in England’s last ODI, the loss to Pakistan in the Champions Trophy semifinals in June. He was again preferred there ahead of Jason Roy for the start of this series and seized his opportunity. Bairstow needed just 97 balls for his near faultless century, striking 11 fours and batting through England’s innings. His century came from a drive through extra cover. He and Stokes ran three and he celebrated with a leap and a punch in the air. Stokes ended it straight after with his second six and was 23 not out as England barely broke a sweat to win. Kesrick Williams was West Indies’ best bowler with 2-50, removing Root and England captain Eoin Morgan for 10. It began brightly for West Indies in Gayle’s first one-day international since the 2015 World Cup. He was dropped by Root on 0, then hit three sixes and two fours in his 37 from 27 balls. Gayle fell as he was starting to get going, though, this time when Root held onto a second chance with a brilliant running catch at extra cover. West Indies lost all their momentum in the middle overs, with Stokes leading England’s bowlers on his return after being rested for the one-off Twenty20 game on Saturday. The International Cricket Council said following the match that the West Indies’ loss meant that Sri Lanka had qualified for the 2019 Cricket World Cup in England and Wales. The ICC said that with Sept. 30 as the cutoff for automatic qualification, West Indies could not move past Sri Lanka regardless of the outcome of their remaining matches in England. West Indies could still qualify for the 2019 event via a qualifying tournament next year. Sri Lanka became the eighth team to qualify directly, joining defending champions Australia, Bangladesh, England, India, New Zealand, Pakistan and South Africa.